Robert's house. Robert Parrinson's utama in Barnes, London. 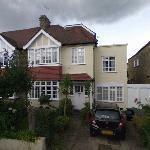 Images in the Robert Pattinson club tagged: robert pattinson house mansion barnes london england. This Robert Pattinson icon contains villa, villa, resort, hotel resort, resort percutian, resort hotel, and holiday resort. There might also be manor, rumah manor, vino, lychgate, lichgate, rumah besar, manse, dewan, tempat tinggal, rumah agam, mansion house, pastori, and tempat penginapan.